Chefs Supplies - Lowest Prices! The Mundial Warranty - all Mundial products will be free from defects in materials & workmanship, during normal use, as long as you own them. Mundial Scissors and Shears are guaranteed for life. These Mundial scissors and shears are preferred by more quilters, tailors and hair stylists around the world! 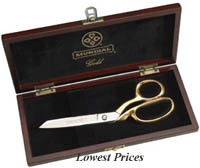 We stock the complete line of Mundial scissors and shears at the lowest prices! High Quality for less! For Scissor Storage Idea's Click Here! Check out our Electric Scissor Sharpeners! 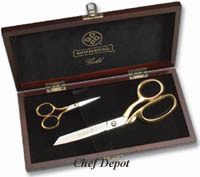 This is our Classic Forged Gold Dressmaker Shears. These 8 in. Gold-Plated Dressmaker Shears are made to last. Features solid 18 karat gold-plated handles. Each gift box is lined in luxurious black velvet. Highest Quality & Made to Last! Lifetime Warranty. Electric Scissors Sharpeners! Click Here! This is our Classic Forged Gold Dressmakers Gift Set. Featuring a 8 in. Gold-Plated Dressmaker Shears and a 4 in. Gold-Plated Embroidery Scissors. Both feature solid 18 karat gold-plated handles. Each gift box is lined in luxurious black velvet. Highest Quality & Made to Last! Lifetime Warranty. 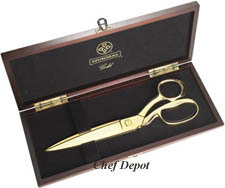 These are our Classic Forged Gold Ceremonial Shears, measuring 12 in. long they are easily engraved. You can get this done locally. Ideal for ribbon-cutting events. Gift box lined in luxurious black velvet. Solid 18 karat gold-plated handles. Each gift box is lined in luxurious black velvet. Highest Quality & Made to Last! Lifetime Warranty. These are 8 1/2 in. lightweight Scissors, they have alloy steel blades to insure a smooth and easy cutting action. These scissors are perfect for dress makers, fabric cutting, crafts and hobbies. Pots & Pans, Highest Quality! Click Here! These are 4 1/4 in. lightweight School Scissors. They have alloy steel blades with round tips to insure safety and smooth and easy cutting. These scissors are perfect for school work, children, crafts and hobbies (with adult supervision). This is a French style stainless steel peeler. It is made in France out of solid stainless steel with a high carbon steel blade that rotates easily and stays very sharp. It is comfortable and easy to hold. We like this peeler for carrots, potatoes and turnips. Our French Chefs and Culinary Arts students prefer this peeler! These are 8 1/2 in. lightweight Pinking Scissors. They have a zig zag cut (VVVVVV) with a 5 mm wide x 2 mm deep cut. They have alloy steel blades to insure a smooth and easy cutting action. These scissors are perfect for dress makers, tailors, fabric cutting. Lifetime Warranty. Click Here for Chocolate from Switzerland! These are Mundial Thread Clips! They are perfect for upholstery and embroidery or anyone who sews a lot. 4 1/2 in. long, solid stainless steel, comfortable and easy to use. Many quilters tell us these are excellent clippers! These clips are made to last a lifetime, they come apart and can easily be resharpened. These clips are also used for upholstery work, cutting fine wire and plastic mesh, dressmakers, tailoring and fabric cutting. These are Mundial Thread Clips! They are perfect for quilters and anyone who sews or clips a lot. 4 1/2 in. long, lightweight, comfortable and easy to use. The local quilters guild gives these clips five stars! They agree these clips are the best made today! Electric Scissors Sharpeners on sale now!